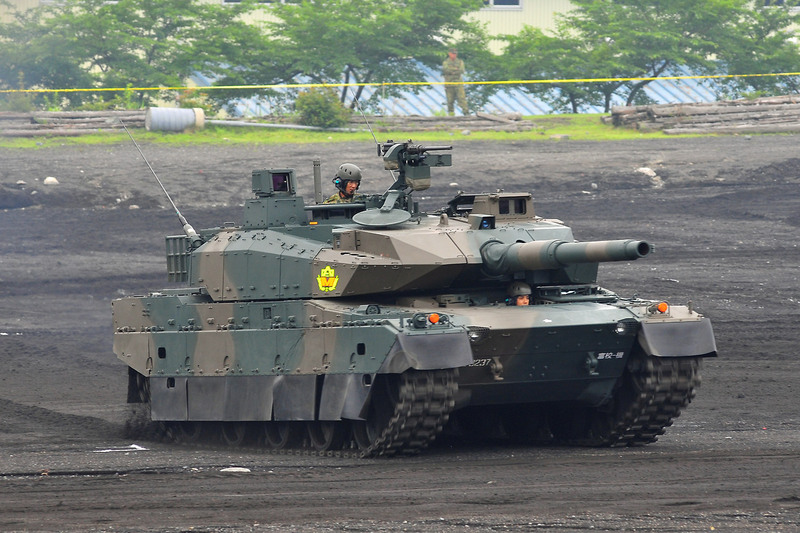 Japanese Type 10 main battle tank. Steel plate or composite armour. May be supplemented by explosive reactive armour plating. A Main battle tank (MBT) is a subset of tank that fills the heavy direct-fire role of many modern armies. Medium tanks gradually evolved into the new concept of the MBT. This transition happened gradually in the 1950s, as it was realized that medium tanks could carry guns (such as the US 90 mm, Soviet 100 mm, and especially the British L7 105 mm) that could penetrate any practical level of armor at long range. The World War II concept of heavy tanks, armed with the most powerful guns and heaviest armor, became obsolete since they were just as vulnerable as other vehicles to the new medium tanks. Likewise, World War II had shown that lightly-armed, lightly-armored tanks were of little value in most roles. Even reconnaissance vehicles had shown a trend towards heavier weight and greater firepower during World War II; speed was not a substitute for armor and firepower. The Main Battle Tank thus took on the role the British had once called the 'Universal tank', filling almost all battlefield roles. Typical Main Battle Tanks were as well armed as any other vehicle on the battlefield, highly mobile, and well armored. Yet they were cheap enough to be built in large numbers. The classic main battle tanks of the 1950s were the British Centurion, the Soviet T-55 series, and the US M47 and M48 series. These three basic vehicles were upgraded significantly over time. For example, the Centurion began life with the highly effective 17-pounder (76.2 mm) gun, but was upgraded to 20 pounder (84 mm) and then 105 mm main armament by 1959, with improved fire control and new engines. The T-55 started with a 100 mm gun, but has been upgraded with both 105 mm and 125 mm guns, much improved fire control systems, new engines, track, etc. The M47 series evolved through to the M60 series. These vehicles and their derivatives formed the bulk of the armored forces of NATO and the Warsaw Pact throughout the Cold War. Some of them remain in use in the 21st century. As of 2005, there were 1,100 M1 Abrams used by the United States Army in the course of the Iraq War, and they have proven to have an unexpectedly high level of vulnerability to roadside bombs. A relatively new type of remotely-detonated mine, the explosively formed penetrator has been used with some success against American armoured vehicles. However, with upgrades to their armour in the rear, M1s have proven invaluable in fighting insurgents in urban combat, particularly at the Battle of Fallujah, where the Marines brought in two extra brigades. Britain deployed its Challenger 2 tanks to support its operations in southern Iraq. Originally, most MBT's relied on traditional steel armor to defend against various threats. As newer threats emerged, however, the defensive systems used by MBT's had to evolve to counter them. One of the first new developments was the use of reactive armor (ERA), developed by Israel in the early 1980s to defend against the shaped-charge warheads of modern anti-tank guided missiles and other such high-explosive anti-tank (HEAT) projectiles. This technology was subsequently adopted and expanded upon by the United States and Soviet Union. The benefit of ERA was that it could be added to existing vehicles to increase their survivability, though the detonation of ERA blocks created a hazard to supporting infantry near the tank. Despite this drawback, it is still employed on many Russian MBT's, the latest generation Kontakt-5 being capable of defeating both HEAT and kinetic energy penetrator threats. The Soviets also developed systems designed to more actively neutralize hostile projectiles before they could even strike the tank, namely the Shtora and Arena systems. Recently, the United States has adopted similar technologies in the form of the Missile Countermeasure Device and as part of the Tank Urban Survival Kit used on Abrams tanks serving in Iraq. Other defensive developments focused on improving the strength of the armor itself; the most notable advancement coming from the British with the development of chobham armor in the 1970s. It was first employed on the American M1 Abrams and later the Challenger 1. Chobham armor uses a lattice of composite & ceramic materials and metal alloys to defeat incoming threats, and has proven highly effective in the conflicts in Iraq in the early 1990s and 2000's; surviving numerous impacts from rocket-propelled grenades with negligible damage. An C1 Ariete in Rome. MBTs are equipped with a main tank gun, and at least one machine gun. 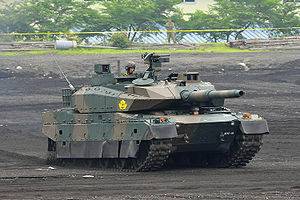 MBT main guns are generally between 100 and 125mm caliber and can fire both anti personnel rounds such as high explosive or high explosive fragmentation as well as dedicated anti armor rounds, usually both HEAT (highly explosive anti-tank), and some form of high velocity kinetic energy penetrator round, such as APFSDS (Armor-piercing fin stabilized discarding sabot) ammunition. The cannon serves a dual role, able to engage other armored targets such as tanks and fortifications, and soft targets such as light vehicles and infantry. It is fixed to the turret, along with the loading and fire mechanism. Modern tanks utilize a sophisticated fire-control system, including rangefinders, computerized fire control, and stabilizers, which are designed to keep the cannon stable and aimed even if the hull is turning or shaking, making it easier for the operators to fire on the move and/or against moving targets. Usually, a MBT carries 30-50 rounds of ammunition for its main gun, usually split between HE, HEAT and kinetic energy penetrator rounds. Some MBT's may also carry smoke or white phosphorus rounds.Some MBT's are equipped with an auto-loader, such as the French Leclerc, or the Russian T-64, T-72, T-80 and T-90 and, for this reason,the crew is reduced to 3 members. The MBTs' secondary weapons, usually comprised of between one and four machine guns are used to engage infantry and light vehicles. Many MBT's mount one heavy caliber Anti Aircraft Machine Gun (AAMG), usually of.50 caliber (like the Browning M2 or DShK 12.7mm AAMG), which can be used against helicopters and low flying aircraft, although their effectiveness is limited in comparison to dedicated anti-aircraft artillery. The tank's machine guns are usually equipped with between 500 and 3000 rounds each. MBT, like previous models of tanks, move on treads, which allow a decent level of mobility over most terrain including sand and mud. They also allow tanks to climb over most obstacles. MBTs are impermeable, so they can even dive in not too deep water (3 meters max). On the other hand, treads aren't as fast as wheels, so the maximum speed of a tank is about 65 km/h (72 for the Abrams M1). The extreme weight of vehicles of this type (60-70 tons) also limits their speed. They are usually equipped with a 1200-1500 HP engine (more than 25000 cc) with an operational range near 500 km. The Main Battle Tank fulfills the role the British had once called the 'Universal tank', filling almost all battlefield roles. The modern light tank supplements the MBT in expeditionary roles and situations where all major threats have been neutralized and excess weight in armor and armament would only hinder mobility and cost more money to operate. ↑ Komarow, Steven (2005-03-29). "Tanks take a beating in Iraq". Usatoday.Com. http://www.usatoday.com/news/world/iraq/2005-03-29-abrams-tank-a_x.htm. Retrieved 2010-04-09. ↑ Komarow, Steven (2005-03-29). "Tanks adapted for urban fights they once avoided". Usatoday.Com. http://www.usatoday.com/news/world/2005-03-29-tank-inside_x.htm. Retrieved 2010-04-09.